As I was working this morning, I went through my “process” as always. 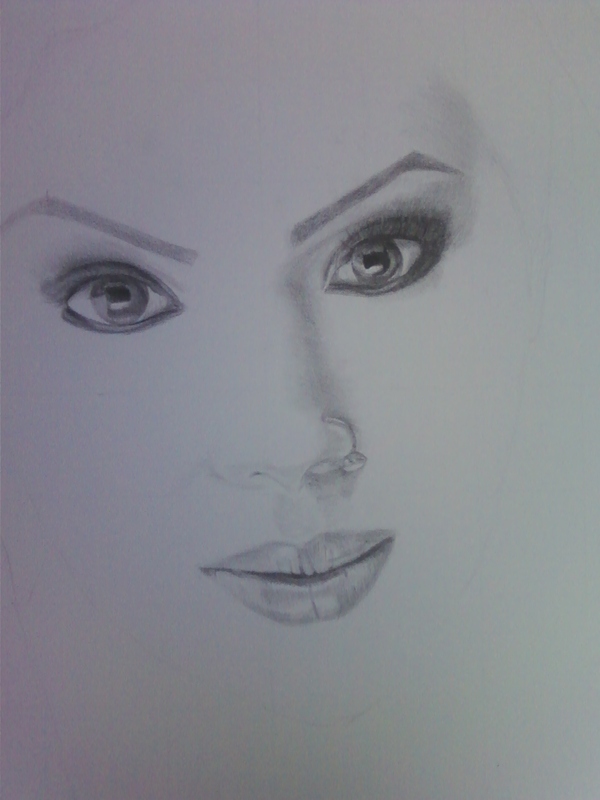 I’ve been working on the eyes and nose for a few days on and off, but I tackled the mouth today. I watched the unfolding of the thing…on paper and inside of me. I find this kind of thing intriguing because of the way it always goes. I start working, feeling like I will get to where I want to be and as I start, things look flat. And not even close. And I hear my mind saying “it’s so flat. It doesn’t look right. Are you really going to be able to do this? It’s not really looking….right….hmmm….well maybe….kind of….it’s getting there. But it’s still flat. How lame….okay….better now….hey! It’s looking not half bad! Wow! How did that happen? How does that happen every time? It’s always such a miracle! And I think there are a few more voices offering other interesting perspectives. Without fail, nearly every time, it always seems miraculous…because some part of my mind can’t see how it’s going to get there when I start working. Every time. I notice that I try to share this with other people around me when the “breakthrough” comes, but nobody else really understands (at least nobody around me). It’s really a miracle every time for me. Like, who’s doing this? I wonder…do other artists just not have this kind of experience? There’s ALWAYS a question if it’s going to work, but about 98% of the time, it does. I think a large part of the enjoyment I get out of working at all is the miracle that seems to occur every time. I just draw what I see with great care…ultimately trust that the pieces will come together…and they do. I know (or at least think I know) that this drawing will astound and delight me as I move through it….as they often do :-). I’ve actually taken special care this time to really go slowly and enjoy each phase as it emerges. Just sit with it and look at the eyes…I did that for a bit before continuing. It is 18 x 24 (poster size) and it will be her full head when I’m done (unless I decide to stop at some point and leave it unfinished). This entry was posted in Uncategorized by lurylee. Bookmark the permalink. I have a friend who is a heavy equipment operator. He did a major job for me a few years ago that involved 2 months of digging and excavating and reshaping the land for a construction site. We were careful to keep the contours natural and bring the land back to it’s proper form as we completed the job, which made it take longer than required by the grading permit and the civil engineer’s specifications. It was worth the effort, but we worked 14-16 hour days 7 days a week for the whole two months. At one point he told me that whenever it seems like the job is too big, or too difficult, just keep digging. If you focus on the work instead of the end, you will suddenly look up at some point and realize that you are done. I have found this principle to be universal. So just keep digging!